Shelby American is back into the spotlights with its brand-new Mustang Super Snake in 2018 guise, which is a completely new muscle car with a more aggressive aero kit, and more power under the hood, way too powerful than the Ford`s own Mustang. The 2018 Shelby Super Snake`s more muscular design language and impressive power under the hood are also highlighted in the commercial below, entitled “All-New Shelby Super Snake”. All in one, this particular model is valued at $113,445, and comes with optional painted stripes, wide body kit, track suspension, car cover as well as an impressive power upgrade. In terms of visuals, the new Shelby Super Snake brings fresh the new front fascia with the Shelby badging at the bottom of the grille, adding as well a new lower section, now far more complex and comprising multiple ducts for increased air cooling. Other main highlights include updated wing at the rear and bespoke diffuser, as well as fresh side sills and the massive 20-inch forged alloy wheels finished in black or bright metallic. As for the impressive power upgrade aforementioned, the 2018 Shelby Super Snake is equipped with Ford`s very own 5.0-liter V8 engine, now coming with a supercharger which raises the power to a total of 800 horsepower. Mechanically, the car also features Brembo brakes with six-piston calipers up front and four-piston in the rear, along with new radiator, performance half shafts and heat exchanger. 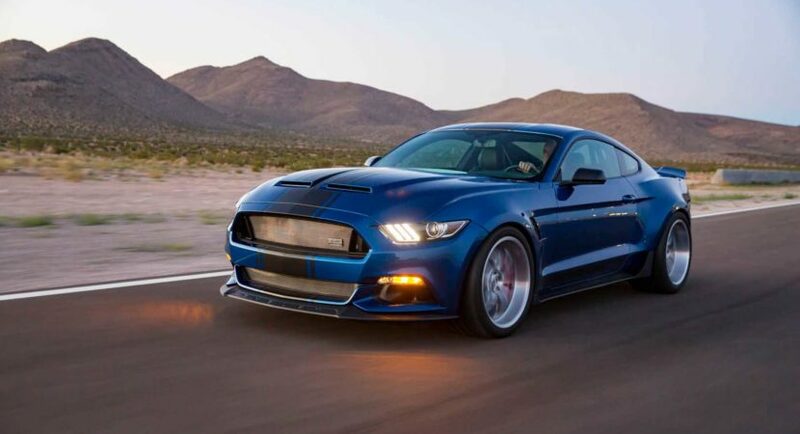 With the new power in mind, the new Super Snake is able to achieve the 100 km/h milestone in a staggering 3.5 seconds, and that despite its sheer size. Compared to the 2018 Shelby Super Snake, Ford`s very own supercharged Mustang in the GT500 iteration is less powerful, meaning 750 horsepower, squeezed from the same 5.0-ltier V8 engine. However, it does come with a standard manual transmission or a dual-clutch automatic, offering its customers the choice of taking it out for a spin on the track or drag strip to achieve the maximum out of it.